The IntelliVue family of networked patient monitors gives care teams throughout the hospital more of the information they need right at the patient's side presented in clear and meaningful ways. All share a common user interface and outstanding industrial design. 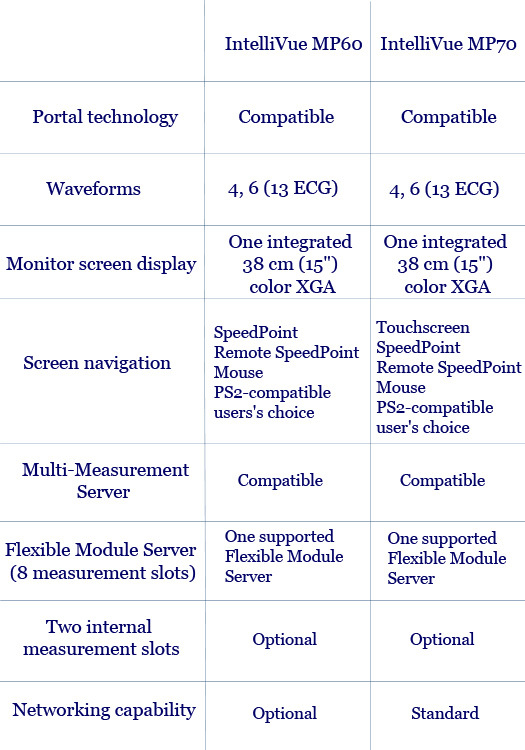 Philips innovative portal technology is available on the portable MP40 and MP50, the versatile MP60, MP70, and the MP90 for the highest acuity patients. The IntelliVue series also includes the compact, networked MP20 and MP30 for flexible care and patient transfer. Multi-Measurement Servers enable data continuity between monitors throughout the patient stay. Patient monitoring and clinical analysis - connected IntelliVue MP60 and MP70 patient monitors are designed to match the pace and unique needs of adult, pediatric, and neonatal intensive care; anesthesia and peri-operative care; and cardiac care environments. In line with Philips commitment to providing customer choice, IntelliVue is compatible with a range of SpO2 technologies and sensors from Philips, Masimo, and Nellcor. * Smart prioritization of patient information. Portal technology uses Philips Tunneling Control Engine to prioritize physiologic measurements, monitoring information, and alarm notifications regardless of the amount of network traffic. IntelliVue offers uninterrupted patient monitoring without the risk of system overload or additional network connections. * SpeedPoint operation Designed for easy information input and onscreen navigation (optional on MP70). * Customized viewing options View and analyze data in graphical or numerical formats, juxtapose real-time measurements and trended data, and organize every onscreen element from waveforms to data labels as desired. * IntelliVue comes with 10 pre-set screen configurations. * 38cm (15˝) color XGA monitor display with 4 or 6 waveforms is bright and easy to read. * No separate hard drive and no fan. IntelliVue is space-saving, quiet, stable, and starts quickly.